Tha cothrom aig Caley Thistle leum suas dhan treas àite san Championship oidhche Mhàirt is Alloa a' tighinn a chèilidh orra. Bidh sgioba Iain Robasdain ag amas air togail air mar a chluich iad an aghaidh Phartaig oidhche Haoine, geama a bhuannaich Inbhir Nis 2-1. 'S e tadhal àlainn bho Tom Walsh a rinn a' chùis dha Inbhir Nis, is bidh an Robasdanach air a dhòigh gun do chum an sgioba aige a' dol às dèidh do Phartaig tighinn air ais gu 1-1. Tha coltas ann co-dhiù gu bheil ICT a' fàs cleachdte às ùr ri geamaichean a bhuannachadh, is iad air an luchd-leantainn aca a chur drol nas tràithe san t-seusan le cho tric 's a bha iad a' crìochnachadh co-ionnan. Thog na trì puingean aig Firhill ICT os cionn Dhùn Phàrlain, agus le Ayr air a dhol bhuaithe beagan anns na seachdainean mu dheireadh, tha a h-uile coltas ann a-nise gu bheil na trì sgiobaidhean a' farpais airson dà àite play-off. Bha ICT is Alloa co-ionnan 2-2 ann an Inbhir Nis tràth san t-seusan is b'e 0-0 a bh' ann an uairsin ann an Siorrachd Clach Mhanann. Aig an taigh ge-tà, is an aghaidh chluicheadairean a bhios air là-obrach a dhèanamh tron là, 's e geama a tha seo a bhios Inbhir Nis an dùil a bhuannachadh. Bidh an dà chuid Caley Thistle agus na nàbaidhean aca Ross County a' cumail sùil air a' gheama eile san Championship oidhche Mhàirt is Dùn Phàrlain aig an taigh an aghaidh Dundee United. 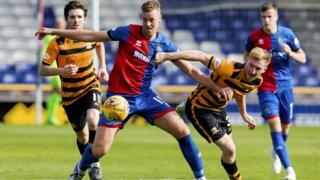 Tha na Pars ag amas air na trì puingean gus uallach a chumail air ICT is Ayr san rèis airson nan àiteachan play-off, is ged nach eil iad air a bhith a' cluich ball-coise fìor mhath, tha iad a-nise air còig geamaichean a bhuannachadh ann an sreath. Chan eil United fhèin air a bhith cho math sin, ach às dèidh dhaibh a' chùis a dhèanamh air Ross County an t-seachdain seo chaidh is air Alloa Disathairne, tha cothrom aca an seo a' bheàrn aig a' mhullach a ghearradh gu dìreach dà phuing. Ged a bhios United air dà gheama a bharrachd a chluich na County, dh'fhaodadh e na h-uimhir de dh'uallach a chur air sgioba Inbhir Pheofharain ma theid a' bheàrn a ghearradh.